Charley attended the National School in Thornbury (now St Marys School). On 31st January the Governors of the Grammar School awarded Charley a scholarship of 6 shillings and 6 pence, subject to him ‘passing in 2 subjects in a higher Standard at the next inspection and diligence and good conduct throughout the year’. We have been told that when Charley went home with the news ‘His mother clipped his ear for excitedly interrupting her conversation’ and he was not allowed to go to the Grammar School. Charley went into the building trade after leaving school. He became a builder and stonemason like his father. Charley’s father used to help keep Eastwood Park in order and Charley as a young boy would help his father in the work shop there. Charley would have preferred to have become a carpenter but his parents could not afford the apprenticeship for that trade. Lady Jenkinson was holding classes in carving for boys at that time but she was adamant that only Falfield boys were eligible so Charley never got the chance to learn properly. He was determined that if others had carved without lessons in the art, he could and so he began to teach himself. One of his first jobs was a hat stand for his brother who was about to get married. On 19th February 1916 Charley applied for exemption from military service on the grounds that he would lose business and customers if he were to be called up. This application was rejected on 11th March 1916 and Charley enlisted for the 10th Labour Battery of the Royal Berkshire Regiment “B” Company. He was discharged from the army aged 36 on June 12th 1916 “being permanently unfit for service …not likely to become an efficient soldier.” We understand that Charley had a ‘valvular heart disorder’. Charley was described as being five feet three and half inches with a thirty three inch chest. He was described as a builder from Crossways. Charley lived in the era of mop fairs in Thornbury and could remember the first motor car appear in the town. He could even recall the last visit Queen Victoria made to Bristol in 1899. He went by train from Thornbury to Bristol to see the Queen and had great difficulty in making his way through the crowds. He had to make his way through Bristol and climbed a tree near the top of the gorge to get a good view. 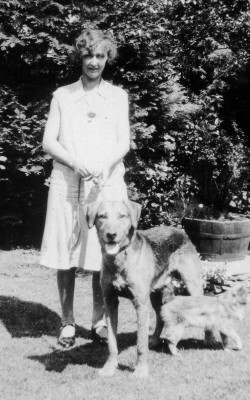 Charley’s wife was Leah Allen whom he married in the Bristol area in 1925. In the 1911 census Leah was a draper’s assistant living with her parents, John and Mary Ann in Crossways. John was working as a gardener at that time. Charley built his own house, The Firs at The Knapp. He was very proud of his role in the successive waves of house building in the town. He remembered with particular pride and affection the terraced houses in Gloucester Road opposite the Grammar School. He built the first two houses (now 21 & 23 Gloucester Road) with his brother William in 1913. In 1976 Charley remarked that he “made all those windows out of Thornbury gravel and cement and there isn’t a crack in them after all this time.” The next two houses (nos 25 & 27) were built with William in 1920 and Charley went on to build the last two houses in the row several years later with his youngest brother, Jim, after William had died. Charley said that he had never had a paid holiday in his life although he had paid for others to have a holiday. He was annoyed that the authorities took away his driving licence when he was nearly 90 because he couldn’t get anyone to insure him. However he was able to renew his firearms certificate right up until his death although he said he had never actually fired his 1895 Enfield rifle, which was given to him by his friend. He was a keen gardener and had a greenhouse at his home in Crossways for his tomatoes. He was also greatly involved in the Society of Thornbury Folk. In his retirement Charley took up wood carving. He said “I had been given some old pieces of carved wood and I started copying the patterns. It is mainly in the Jacobean style because I can’t get on with the newer styles like Chippendale.” Charley carved a splendid lectern which was presented to Thornbury Town Council in July 1977 and which appeared in the Armstrong Hall. He was also famous for an even more conspicuous work. It was found that the oak pillars which had been a feature of the entrance to the Church Institute in St Mary Street had become badly decayed. The building bore the date of 1679 and it was thought that these may have been the original ones. In 1971 Charles Davis helped to replace the pillars with the assistance of his brother, Alfred Davis and of Mr C Browning and Mr G Wilson. He was approached by the vicar to make the replacement Church Institute pillars because the vicar had admired the wooden porch for a building which at that time was an antiques shop run by Claude Browning and is now an Indian restaurant. It proved too difficult to sketch the original carvings on the pillars and Mr Davis had to cut out one of the better areas with a saw to make an exact copy of the pillars. 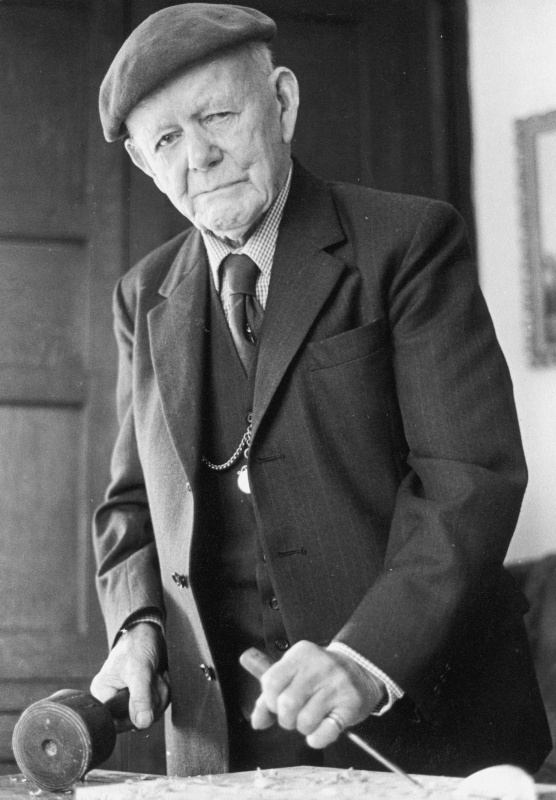 The photograph above is of Charley Davis in 1976 and taken when Charley was 99 years old and working on a four-poster bed. 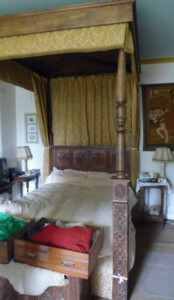 We believe that the four poster bed which was made by him the same year might be the one he was working one in the photograph. The bed in question is shown in the coloured photograph on the left above. Charley’s 100th birthday party was celebrated at St Mary’s School with 100 guests. The Town Council planted trees to mark the centenary. Leah died in 1969 aged 85. Charley died in 1980.